The Eugene Dupuch Law School is named after the famed politician and lawyer, the late Hon. Eugene Dupuch. It is the third and most recently established law school of the Council of Legal Education (Caribbean). The Council of Legal Education was created by a treaty signed and ratified by countries in the Caribbean Community. The Eugene Dupuch Law School opened its doors to its first students in September 1998. Like its sibling schools, the Hugh Wooding Law School in Trinidad and Tobago and the Norman Manley Law School in Jamaica, which were both established in 1975, the Eugene Dupuch Law School prepares students for admission to practice in Caribbean territories. 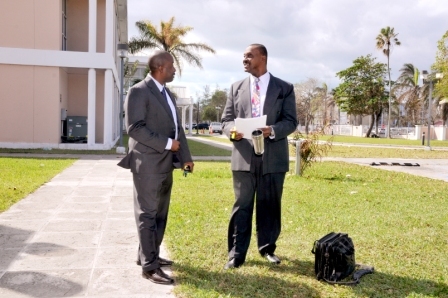 To date, students who have graduated from the Eugene Dupuch Law School have come from Anguilla, Antigua, The Bahamas, Barbados, the Turks & Caicos Islands, the British Virgin Islands, Guyana, Jamaica, Trinidad and Tobago, St. Kitts and Nevis, St.Vincent & The Grenadines and the U.S. Virgin Islands. This consists of a male Magnificent Frigate Bird with outstretched wings with a red throat patch in its breeding season, perched on a gold balance on a wreath alternatively gold and red. The Supporters: On the left side a man dressed in a hat and wearing trousers and the sleeves of his open shirt rolled and holding in his hand and resting his foot on an agricultural fork. On the right side a woman dressed in a tartan pattered jupe with bodice and petticoat, wearing a head-dress of Madras cloth and holding in her hand a star-apple plant. The growing plant in the hand of the woman is the symbol of fertility and represents the verdant flora of the region. The man and the woman represents the foundation of the West Indian family life and depict the idea of the law being made by and for the people. The Badge: This consist of a gold disc powered with black ermine spots thereon two caimite or star-apple leaves, the one on the left showing the upper side and the one on the right showing the under side. The Hon. Eugene Dupuch, CBE, Q.C.